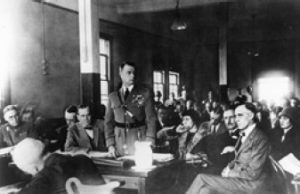 The court-martial procedures began in Washington on October 28, 1925. Twelve generals (two were later dismissed) and a colonel were appointed to sit in judgment, comprising the highest-ranking court ever convened to try an officer. None of them was a flier. Mitchell’s friend, General Douglas MacArthur, was a member of the Court-Martial Board. 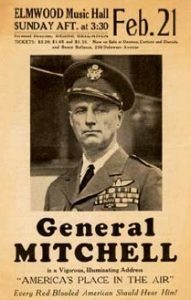 Mitchell’s chief counsel Illinois Congressman Frank R. Reid called many war heroes and celebrities to testify on behalf of Billy Mitchell. His supporters included Major Hap Arnold, Admiral Richard Byrd, Eddie Rickenbacker, Congressman La Guardia and Margaret Ross Landsdowne, widow of LCDR Landsdowne. The court-martial dragged on for seven weeks. When it was over, the board deliberated for about half an hour and rendered its verdict – GUILTY. Billy Mitchell (standing) during his 1925 courtmartial. The sentence was suspension from rank, command and duty with forfeiture of pay and allowances for five years. the public’s interest in Mitchell waned and his influence diminished. William “Billy” Mitchell died on February 19, 1936 of complications of influenza. He was fifty-six years old. 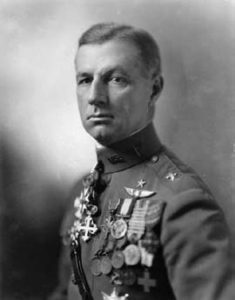 Perhaps the most significant contribution of Billy Mitchell was simply his steadfast and outspoken advocacy of the development of strong, capable and safe military aviation assets – at a time that his commanders clearly did not share, nor welcome, his ideas. By the mid-1930s U.S. Military leadership recognized the importance of air power and began to acquire advanced fighters and bombers that would help the Allies win the Second World War.